You all have heard that the Lion is the King of the Jungle. You may not have heard that the Lion is looking for a new Minister of State. The previous Minister suddenly disappeared. The animals thought they knew why - especially since the Lion had recently gained weight. Only three animals in the kingdom dared to apply for the job. There was the Crocodil e – long and green with snapping jaws. There was the Bear - tall and brown with steel-like claws. And the Little Bunny Rabbit, who always followed the jungle laws. The Lion called them all to a job interview. "As with most Civil Service Jobs - There is a test you must pass to get this job," said the Lion. "It's too late to back out now. To be fair, I am asking you all the same question." "Crocodile, Come here, Crocodile," said the Lion. "You first, Crocodile. Smell my breath. The Lion leaned forward and breathed into the face of the crocodile. "Haaagh..."
"Is it SWEET, like the smell of flowers opening up on the Savanna in the early morning? Or is it FOUL like the stench of rotting meat under the noon day sun?" Your breath would fell a hundred trees. It would bring an elephant to his knees! I'd rather stuff my nose with bees. Than smell your stinking breath..."
Then the Lion said, "Wrong answer, Crocodile. HOW DARE YOU, Crocodile. I can't hire you as my Minister of State. You would insult everybody. Your brutal insults would cause everyone to become an enemy and to make war on our kingdom." Then the Lion fell upon the Crocodile and ate him, "ROAR!!" The Lion grew calm once more, "Bear, your turn, Bear. Come here, Bear," said the Lion. "Take my test, Bear. Smell my breath, Bear! The Lion leaned towards the face of bear and breathed right into the Bear's face. "Haaagh!" "Is my breath sweet like the sweet jungle orchids growing in the top of the trees? Or is it FOUL, like the smell of dead and rotting fish floating in a stagnant jungle pool?" Now the Bear had seen what had happened to the Crocodile. And even though he knew the Lion's breath was terrible, he decided to lie. To smell yo+ur breath, it smells so sweet. Your breath... Oh, I can't lie any longer. Then the Lion said, "Wrong answer, Bear. HOW DARE YOU, Bear? Everyone would hear your sickeningly sweet lies and know you are afraid. Everyone would think we are weak and attack our kingdom." The Lion fell upon the Bear and ate him. Then he looked at the Rabbit. "Bunny Rabbit, your turn, Bunny Rabbit. Come here, Bunny rabbit. Take my test, Bunny Rabbit. Smell my breath. Hahhhh..." This time, the Lion leaned into the Bunny Rabbit's face and exhaled noisily. "Is it sweet like the flowers dripping pollen to be made into honey by the bees? Or is it FOUL, like the stench of rotting meat on the vulture's beak?" Bunny had seen what had happened to both the Crocodile AND to the Bear. He wrinkled up his nose in the air and started wriggling it. An honest answer is a must. I must state, I have a cold...."
"Yes, that's it... I have a cold, he said - beginning to wiggle his nose up and down. 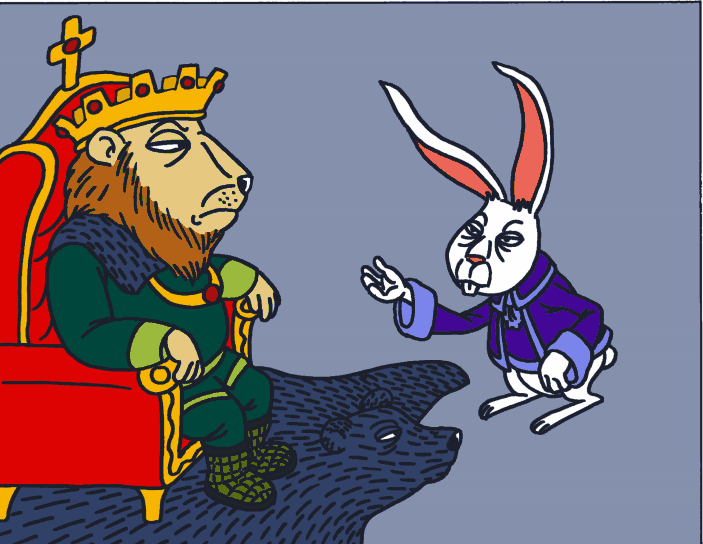 I'm sorry, your Majesty," said the Bunny Rabbit. "I have a cold. Perhaps your majesty could advise me and give me a clue as to what your opinion is. Then I'll be glad to answer." "Oh, good answer, Bunny Rabbit," said the Lion. Unlike the Crocodile, you wouldn't insult everyone. And unlike the Bear, you wouldn't tell everyone what they want to hear. You are open to advice and think fast. Good answer, Bunny Rabbit! You will be my new Minister of State." Now, today most of you have all seen the Little Bunny Rabbit hopping around doing the work as the Lion’s Minister of State. But every time it stops, it remembers to put its nose in the air and wriggle it - pretending to still have a cold.